To celebrate 10 years of good food and community, Market of Choice will host a storewide event *April 15-16 *that will include local vendors, demos and tastings, a giant cake, childrens’ cupcake decorating, a fajita lunch, giveaways, taste-offs and more. For each customer who signs a giant anniversary card on display, Market of Choice will donate $1 to the Ashland Food Project, up to $1,000, that will benefit the Ashland Emergency Food Bank to help local residents. nonprofit – the charity with the most votes will receive a $1,000 donation from Market of Choice. $10 suggested admission, no one turned away! George will be joined by Mark Ross, Eugene Oregon’s most famous unknown folksinger, storyteller, raconteur and multi-instrumentalist.You can hear some of his work at www.lehnherr.com/butte/. What was the Wobbly Walk through the Siskiyous? 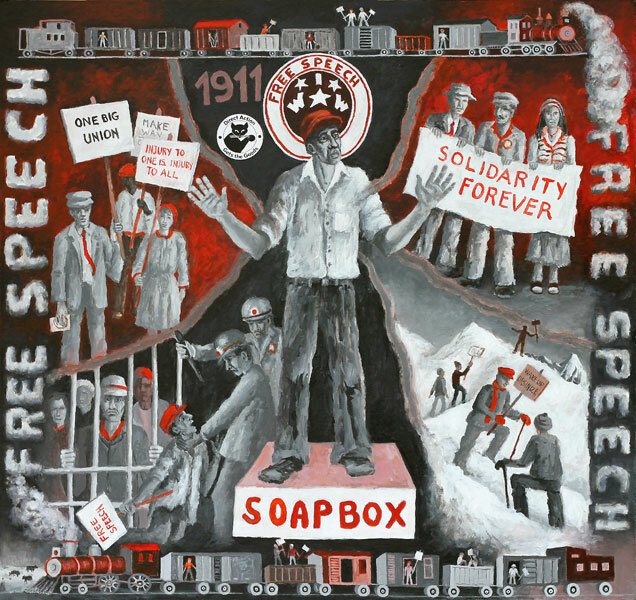 In February 1911, over a hundred members of the IWW left Portland on freight trains bound for Fresno, The group consisted of young working men willing to die for free speech. They risked being beaten by strike breakers. Nearly a hundred Wobblies made the hazardous trek south by foot through the snow-covered Siskiyous after being kicked out of the box cars in Ashland. By the end of their trek they had walked roughly 150 miles across the frozen Siskiyous. Announcing for Southern Oregon… “We Are One” solidarity rallies honoring Dr. Martin Luther King Jr. and his commitment to workers rights. On April 4, 1968, Dr. Martin Luther King Jr. was assassinated in Memphis, where he had gone to stand with sanitation workers demanding their dream: The right to bargain collectively for a voice at work and a better life. The workers were trying to form a union with AFSCME. Join us in solidarity with working people in Wisconsin, Ohio, Indiana and dozens of other states where well-funded, right-wing corporate politicians are trying to take away the rights Dr. King gave his life for: the freedom to bargain, to vote, to afford a college education and justice for all workers, immigrant and native-born. It’s a time to show movement. We are one. April 3, 2011 evening vigil for worker solidarity in Medford followed the next day with “We Are One” April 4 rallies in Medford and Ashland. April 4, 2011 worker solidarity rally in Ashland. Beginning with a 6:30 – 7:30 p.m. candlelight vigil in Medford’s Vogel Park, and continuing April 4 with rallies in Medford and Ashland, unions, people of faith, civil and human rights activists, students and other progressive allies are standing strong in the face of incredible attacks on workers and our communities. 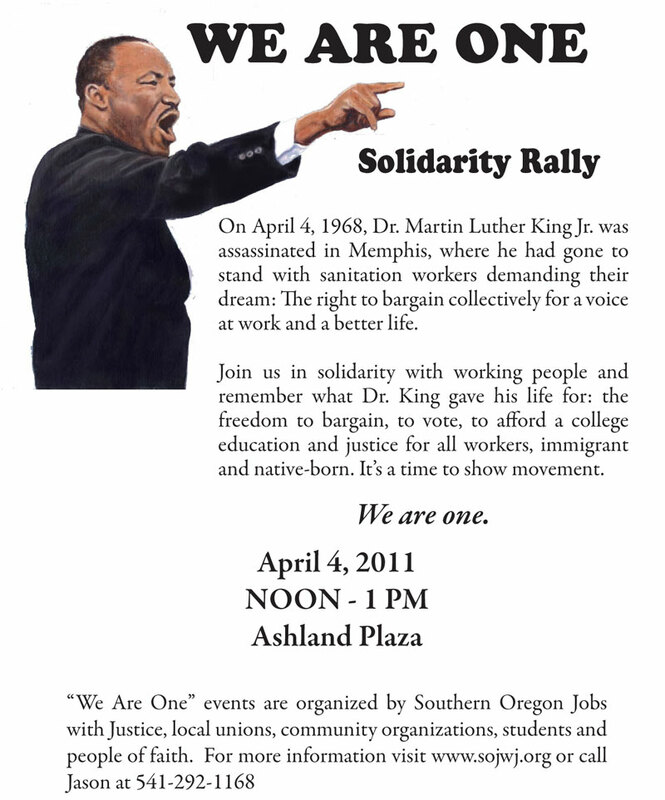 April 3 and 4 “We Are One” events are organized by Southern Oregon Jobs with Justice, local unions, community organizations, students and people of faith. Stories of what we are creating in our Rogue Valley community. The Jackson County Democrats will join with Women in Black and Citizens for Peace and Justice for a special silent vigil to honor the victims of the Arizona shootings Saturday, January 15th, 12:00-12:30 in Vogal Plaza ( Main and Central) Medford. Everyone is invited to stand together for non-violence. Please wear black if possible. Respectful signs are appropriate.